First line: "Eva Nine watched a turnwing flap its triple pair of wings to join its flock." DiTerlizzi continues his sci-fi saga of Eva Nine in this gorgeously illustrated sequel to The Search for WondLA. There are several internet extras embedded in the illustrations, but readers don't need computer access to enjoy the story. DiTerlizzi's two-tone blue and black illustrations are reminiscent of W.W. Denslow's original illustrations for The Wizard of Oz. Eva Nine has long believed herself to be the last surviving human on Orbana but now she joins a human colony for the first time, and after a lifetime of limited contact with other sentient beings, naturally she finds everything very overwhelming. Human pilot Hailey and Nine's older "sister" Eva Eight each have their own agendas and Eva Nine learns a lot about loyalty, friendship and xenophobia. I liked how Eva matures so much in this book. Eva is temporarily blinded by the comforts of her new home in New Attica amongst the human colonists, but after she realizes that she misses her alien friend Rovender, who has been barred from entering the human city, she leaves to continue her search for answers about how their world came to be in ruins. 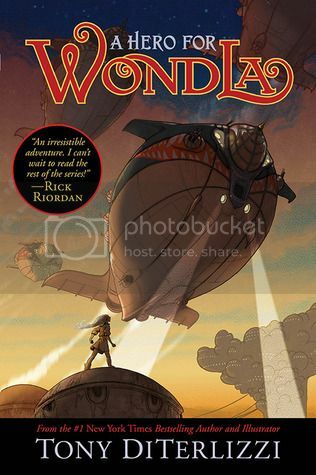 With fantastic world-building, airships, chases, intrigue and mystery, this is a series that has a lot of appeal for older middle grade readers and young YA readers. I'm definitely looking forward to more in this complex and fascinating series.